What kind of zinc does B&S use? When should I change my zincs? Did my zincs fall off? Whenever two metals contact each other in salt water, a current flows between those metals. The electrons that make up the electrical current are taken from one of the metals, causing the metal to corrode. By purposely attaching a metal that is less noble (in this case, a zinc anode) than the metal on parts on your boat, you can protect critical portions of your vessel at the expense of the cheaper zinc. This is why zinc anodes are often called "sacrificial zincs". Propellers, shafts, rudders, struts, etc., can be cathodically protected at the expense of zinc plates and anodes. I hear a lot about aluminum anodes; should I use aluminum anodes or zinc anodes? The answer depends on your application. While aluminum anodes have a greater electrical potential to absorb corrosion (up to 50% more), our hand-poured mil-spec zinc anodes consistently outperform aluminum anodes in salt water . Our zinc anodes dissolve more evenly and completely; while typical aluminum anodes erode unevenly with visible "craters". Often times, aluminum anodes will develop soft white or grayish surfaces which tend to prohibit the anode from dissolving completely. *Please note that some engine manufacturers require you to use aluminum anodes if you are still within your warranty period. 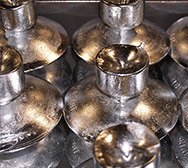 There's a lot of emphasis on "hand-poured" zinc anodes on your website. Why does B&S Marine Anodes hand pour their zincs? How are other zincs made? 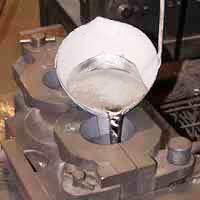 Hand-poured zinc anodes have a higher degree of porosity due to its molecular composition. The process of die-casting changes the molecular structure, therefore effecting how the anode performs and the rate at which it dissolves. This is important because in hand-poured zinc anodes, size for size, there is a greater area exposed to corrosion than die cast zinc anodes. It is also shown that the hot chamber die-casting method has a greater chance of picking up impurities during the manufacturing process, again, effecting the way your anodes perform. Impurities can cause a layer of insulation-like material to build up on the outside of the anode causing it to perform poorly or not at all. Other signs include uneven erosion or flaking. We not only use mil-spec zinc alloy to make our anodes, our finished product is mil-spec and we have the lab reports to prove it, not every manufacturer can make that claim! (copy of lab testing available upon request). How often should you change your anodes? Generally speaking you should replace your anodes when they appear to be half their original size. A season is considered 6 months. Now, there are many factors that determine how long you anodes will last. If you use the boat longer or if you stay in the water year-round, you will have to change your anodes mid-season. If you dock near a steel bulkhead or near a vessel that has an electrical issue the anodes will also dissolve quicker. Water temperature and salinity also have an effect on the rate at which anodes dissolve. With all these factors that are not within your control you should always start out with the best quality anodes with a proven record of extended life under "normal" circumstances, so insist on using B&S Marine anodes every time. Sometimes, mid-season my zincs are gone. Did they fall off? As far as "missing zincs" midseason, often times our customers tell us there was nothing left but the bolts. That's a good thing, because the anodes are doing their job. Unfortunately, you may need to check your anodes more often if they are dissolving before your boating season ends to make sure your boat is protected all season.